Office partitioning systems can assist in the transformation of commercial premises by creating an individual layout that works perfectly for the business in question. With the installation of office partitioning, a working environment can be transformed for the better. By having such a large impact on office space, partitioning can create a whole new working environment and a better atmosphere for both clients and employees. 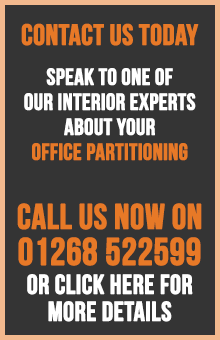 If you would like to benefit from the positive impact of office partitioning, this can be achieved with ease. Working in and around the area of London, Office Partitioning London can help you to reach the ideal working environment that you have always aspired to have. If you own or rent office premises throughout the London area, you may have considered the installation of office partitions. Office partitions help to create a better and more efficient working environment. With a wide array of office partitioning systems to choose from, from screens partitions to glass partitions, you can locate an office partitioning system suitable for your business premises. You can choose from demountable partitioning which provides both adaptability and convenience, or solid wall partitioning which provides a firm and permanent structure. Whether you opt for a demountable or solid office partition, you will find the outcome incomparable, resulting in a transformed working environment. If you have considered relocating to a more workable environment, the installation of office partitions mean you no longer have to. Office screens provide your workforce with increased privacy whilst minimising unnecessary interruptions. There are a variety of sizes and styles of screens to choose from, from freestanding office screens which can separate an entire room, to desktop office screens which enable work space division. Screens can not only increase levels of staff concentration through noise reduction, but they also provide staff with their own private and workable space to make work life that much easier. Whether you require pinned office screens, glazed partition screens or portable partitions, office partitioning can offer the workable space that you have always wanted. At office partitioning London, we can provide you with made to measure office screens that suit the size of your offices perfectly. We are also proud to offer our office partition screen services at a competitive price. If you have always wanted to create an innovative working environment, this can be achieved with ease when featuring office glass partitions in your work place. With years of experience installing effective glass partitions in offices throughout London, you can be assured that your office glass partitions can cope with the demands of your workplace. Our glass partitions provide a minimalist feel whilst enabling a flexible work space. For a seamless finish and an ultra-modern style, office glass partitions are the perfect choice for your premises. With glass partitions, you can choose from single or double glazing with variable levels of audio and thermal performance. You can also select from both framed (either aluminium or timber) or frameless glass partitions dependant on the functionality and appearance you desire.